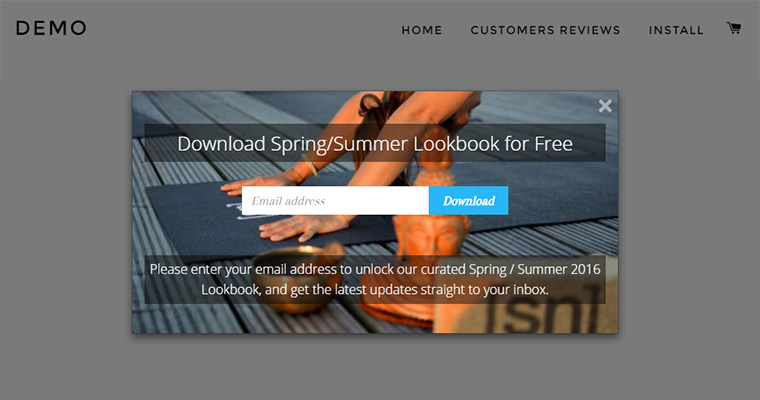 Offer free surveys, lookbooks, downloads to your visitors in exchange for their email addresses. Promote your products providing free downloads and get user emails addresses who are interested in your products. One step setup process lets you run download popup in a few minutes! Change colors, backgrounds and images to fit your theme design. Export e-mail contacts with Omnisend or MailChimp integration or download CSV file directly. Choose the best scenario to show, pre-defined options make it easy to setup. Add some latency or use Exit Intent Technology. You can use Email Before Download app for free as long as you want OR upgrade to Premium plan which costs only $3.99/mo and unlock awesome pro features.